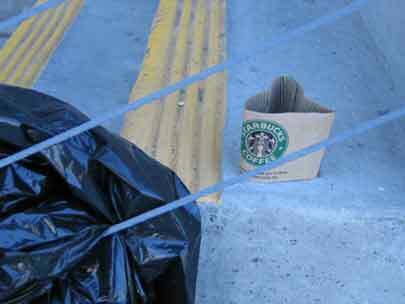 Starbucks produces incredible amounts of trash. It seems like everywhere I go there is some piece of trash with their logo on it. It made me think I needed to document this somehow. Please snap pics of the starbucks trash you see and soon I will be making it possible to post this history of their garbage together. But I thought your picture was kinda cute, with the Starbucks holder in the shape of a heart…ironic. see that’s why i love you – you see hearts in the trash even. so sweet!